In the exercise, children create a magical machine that children use to rehearse letter-sounds. But – oh no! The machine is now broken so children must make the sound with their voices! Try some different monster voices once you’ve got the sounds right. If you have any other successful games and resources you’ve made for your students and children then please do send a link. We’d love to see what works for you! Occasionally we post links to our favourite phonics and teaching activities by talented teachers and parents around the web. 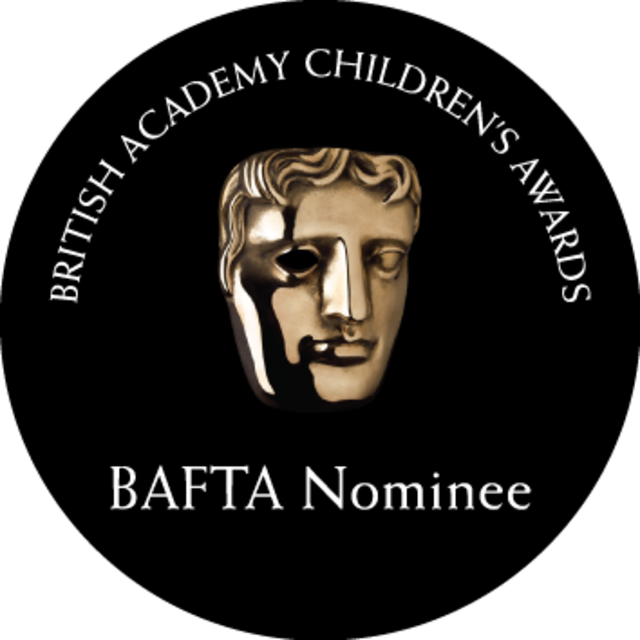 If you have any other successful games and resources you’ve made for your students and children then please do send a link. We’d love to see what works for you! The Imagination Tree blog have a fantastic phonics activity which complements Teach Your Monster to Read with its spaceships and rockets! Create new spacecraft for your monsters and practise blending at the same time. For full details on how to make this game go to the The Imagination Tree blog. Monster tip: Make sure the child rehearses blending all through the word. You can also adapt this game for longer words too! 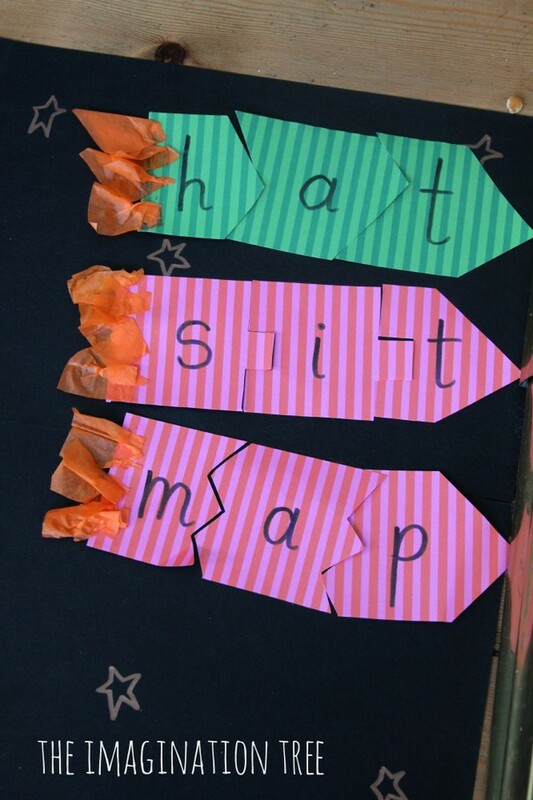 Here’s a great phonics game we found on Reve Pounds’ Pinterest page. Raaarrr! Create your own creatures to blend and segment. Children put the parts together to practise blending all through the word with different grapheme-phoneme correspondences. Check it out on Pinterest: Alligator blending game. Occasionally we post links to our favourite phonics teaching activities by talented teachers and parents around the web. If you have any other successful games and resources you’ve made for your students and children then please do send a link and explain how this helped your students practise their phonics. We’d love to see what works for you! 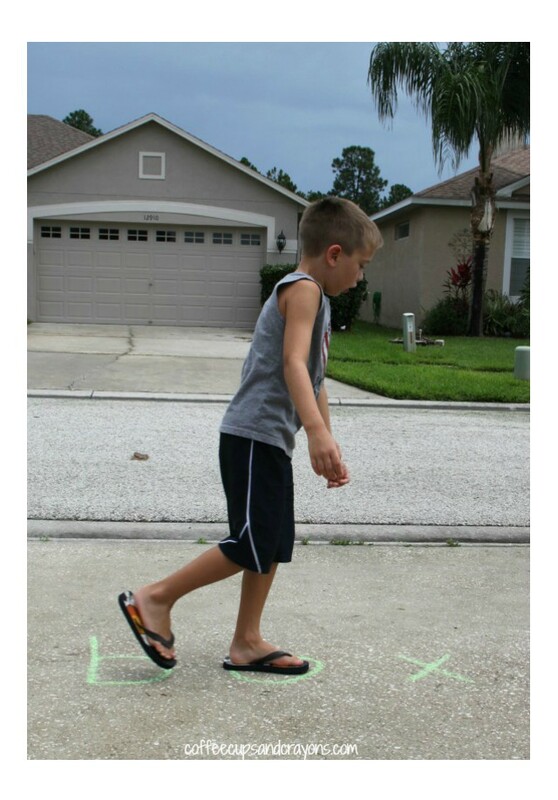 Check out this great phonics game from the Coffee Cups and Crayons blog that kids can play outside on the pavement to help them with their blending practise. It’s a bit like hopscotch – which happens to be one of the monsters’ favourite games. Find out how to play at: Walk the word and sound it out. Our Monster tip for this game: Some children may find reading the letters difficult this way as they do not look the same as they do on the page. If they do, children could face each letter (stand on top of it or below it) and jump to the right saying each sound as they go. It’s World Book Day this week and the team at Teach Your Monster to Read have put together a list of monster-related books. Here’s a few of our favourites. Please send in your recommendations as we’d love to hear what other monsters our fans like to read about. This is a wonderful, classic tale of the underdog (or should I say under-mouse?). 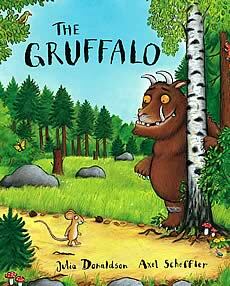 It is written by Julia Donaldson, the UK’s Children’s Laureate. The story follows the adventures of a mouse, who journeys through the deep, dark wood and meets a number of hungry woodland creatures along the way. The rhyming narrative keeps a great pace and it contains lots of lovely repetition which means it’s quick to learn off by heart. It is humorous, fun to read and the illustrations really bring the story to life. There’s also few scary bits to keep children excited. It’s a personal favourite in my house. A few parents I know have called this “The most depressing children’s book ever written”. It certainly is a sad tale and poor old Bernard does get rather a raw deal but it’s also fun, short and the colourful illustrations draw both children and adults into the story. There is a very clear life lesson in this book: don’t ignore your children or they’ll turn into monsters. 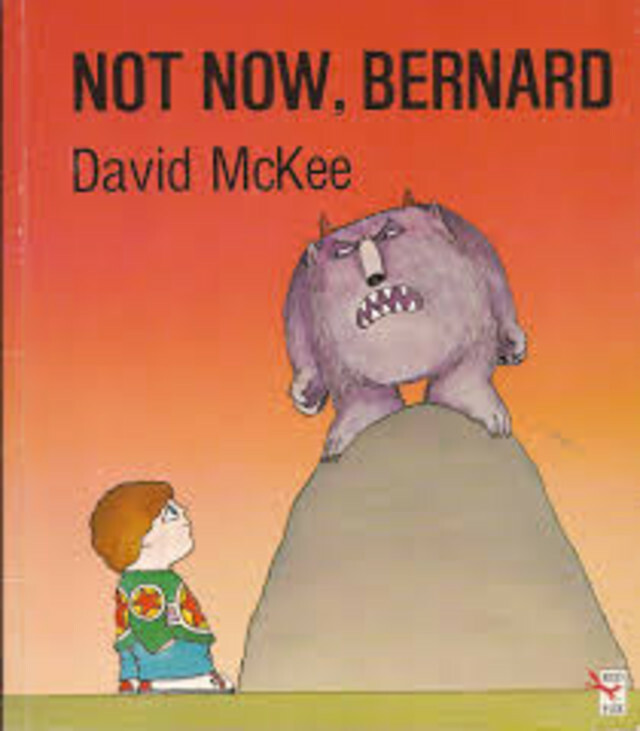 Not Now, Bernard is a stage play, showing at the Unicorn Theatre, London this spring. I had to include this book as I’ve had so much fun make monsters out of it. 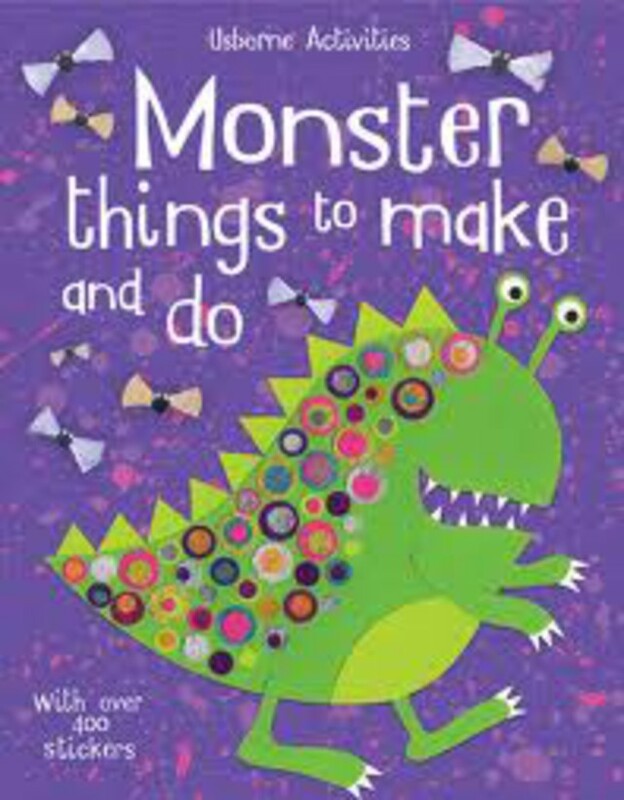 There are 18 different monster activities, including a wobbly monster, a monster mask and a bookmark. It’s fun and colourful and all the activities are really easy to make with your child. 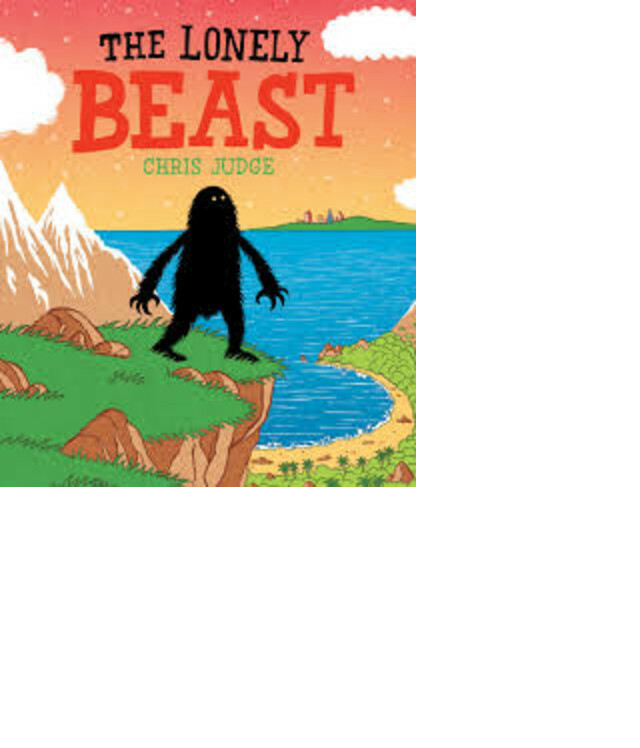 It’s a great inspirational resource for a monster loving child on rainy day. This is a story about a beast’s journey to find some other beasts just like him. He travels across the world, walking and searching for some friends. He ends up in a city and becomes a media celebrity – possibly the loneliest place of all. The story is well told, the illustrations are captivating, and it has a happy ending. There’s an additional Lonely Beast ABC app if your children love the character and want to see more. Could this be the most disgusting children’s book ever written? If not, we think it’s the most disgusting monster book ever written! I cannot imagine any child who doesn’t delight in the revolting not loving this book. It’s silly, animated and above all fun. Sarah McIntyre’s illustrations are fantastically detailed and the story will capture your child’s imaginations and yours too – up there with Fungus the Bogeyman for gross! 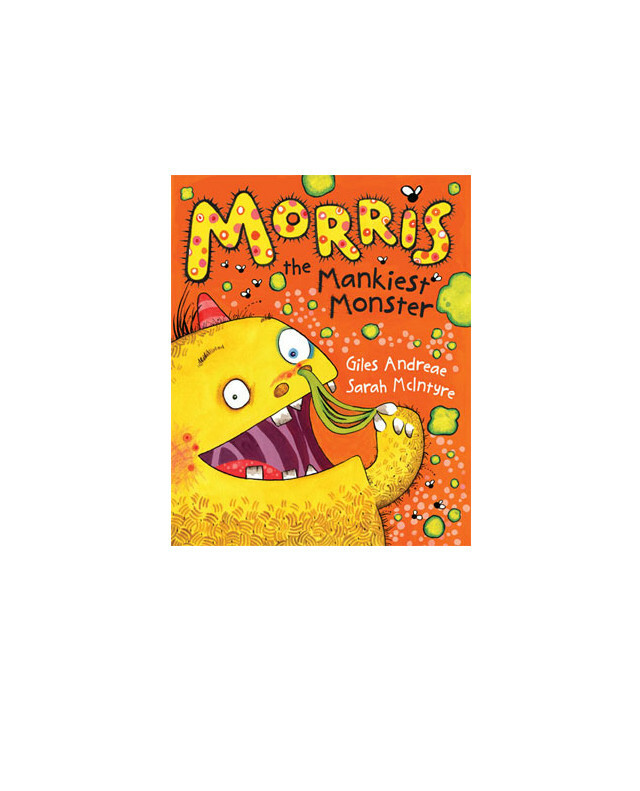 If you like Morris then there’s some wonderful monster-related worksheets to download on Sarah’s blog. Please add your favourite monster books here. There’s so many and I know we’ve forgotten the classics. Have fun on World Book Day! Teach Your Monster to Read at BETT. Last week, the team at Teach Your Monster to Read attended our first trade show! We were exhibiting at BETT: the biggest Educational Technology event in Europe. Our stand was was on the Edtech Pavillion: an interesting space full of new start-up companies, hoping to find new customers within education and compete with the larger organisations filling the main hall at BETT. The show was very busy from day one! Our main aim was to introduce our phonics game Teach Your Monster to Read to Primary Teachers, Headteachers, ICT Co-ordinators, Educational Consultants and Journalists. Our other objective at BETT was to gather feedback from teachers about the game, helping us to improve the user experience and make the website more teacher-friendly. We met some fantastic teachers who’ve helped us a great deal – thank you Janie, Susan, Lee, Annette, Dawn, Alison, Sarah and Nas! 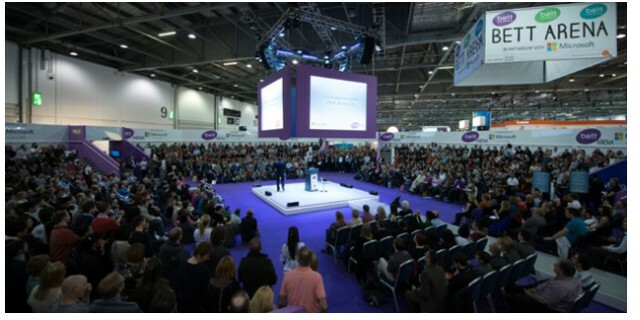 The BETT Show itself is a huge event, with companies showing the best in educational technology and publishing. It’s fascinating to see what’s out there. Little Bridge – a wonderful and detailed world created to teach the English, includes apps, online games and engaging characters. Classroom of the 80s – essentially a chance to play some retro 80s arcade games (inspired!) but also include teaching packages for students to learn programming using the BBC’s BASIC software. Raspberry Pi were there, demonstrating all you can do with a low-cost, tiny computer – think robots! Dynamo Maths looked interesting and an effective maths resource – particularly geared towards learners with dyscalculia and learning difficulties with maths. 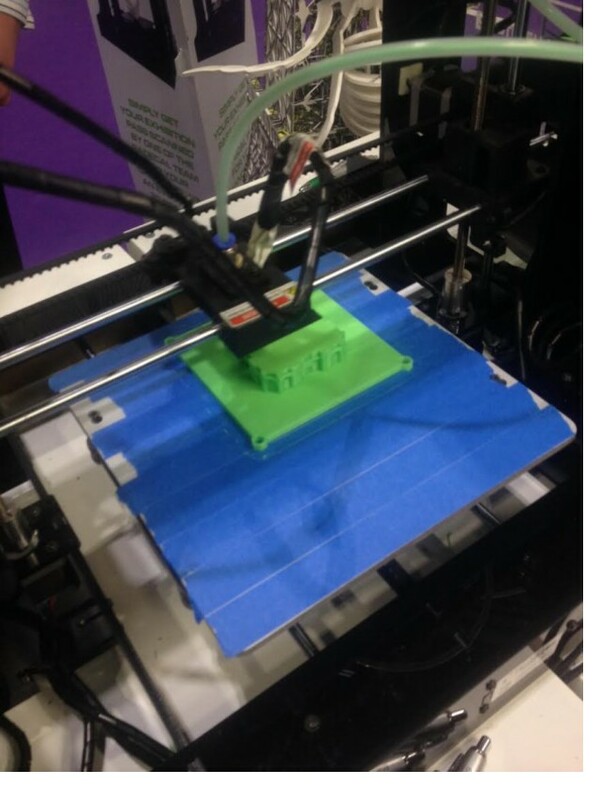 On a personal note, i saw my first 3D printer in action. Here it is making a tiny Taj Mahal. I also heard Sir Ranulph Fiennes speak about his incredible adventures across the globe. Awe-inspiring and he is also funny too! Lastly I attended the final keynote debate, addressed by ‘learning adventurer’, Tim Rylands, Tomorrow’s World’s, Maggie Philbin and Facebook Policy Director, Simon Milner who gave us their thoughts on the future of education. “Technology should not replace the teacher, but it could replace the classroom” said Tim Rylands – it’s an interesting one to think about. 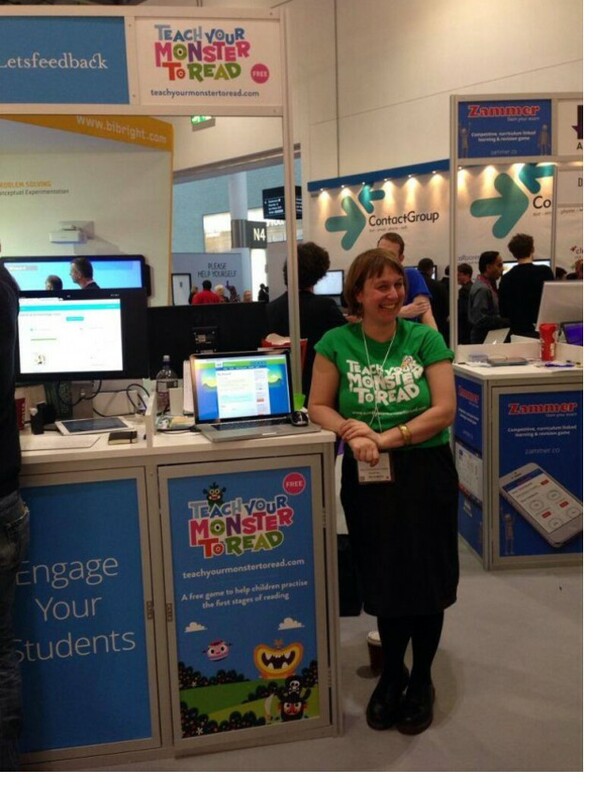 Come and talk to the monsters at BETT! The Teach Your Monster to Read team will be attending the BETT Show in London this month (22nd – 25th January) and we’re really excited! The BETT Show is the number one show for educational technology and learning in the UK and many big names in the business will be attending. This years’ speakers include Sir Ranulph Fiennes, Lord David Puttnam and Richard Gerver. Attending the show is a fantastic way to find out what is new and what technology really inspires teachers in the classroom. We’re really excited to be going to BETT as it’s a chance for the team to meet teachers and educators face-to-face. This year we’d like to talk to teachers about some improvements we’re thinking of making. If you have 30 minutes free at the show then we’d love to meet you. We’re specifically looking for primary teachers who are involved in any way with reading. You don’t need to have used Teach Your Monster to Read before, we’re keen to hear from teachers who are completely new to the game and those who are frequent players, so do pass this on to friends and colleagues who are attending the show but haven’t played the game. As a thank you for your time we’d like to offer those who meet us £50 worth of Usborne books. Teach Your Monster to Read will be on the Edmix Pavillion (Hall/Stand B228) and we’re taking appointments on Wednesday 22nd January, Thursday 23rd January and Friday 24th January. Please sign up to this Doodle calendar with the time you would like to attend. http://doodle.com/kmhgx5rp5aai4uah and email [email protected] to confirm your contact details. Thanks! We’ll be giving some free foldable monsters and badges and they’ll be a monster photo competition each day of BETT to win £150 worth of Usborne books and a Teach Your Monster to Read kids T-shirt! The 2014 BETT Awards winners will be announced next month so we thought it would be a good time to take a look at the free teaching resources, tools and apps that have been nominated in the Free Digital Content / Open Education Resources category. 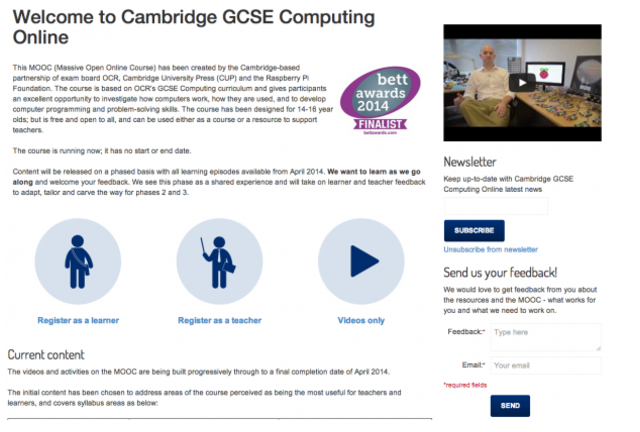 This is a massive open online course (MOOC) created by the Cambridge-based partnership of exam board OCR, Cambridge University Press (CUP) and the Raspberry Pi Foundation. The course is based on OCR’s GCSE Computing curriculum and teaches students to understand how computers work, how they are used, and to develop computer programming and problem-solving skills. The course is open to everyone without any start or finish date and can be used as a computer science teaching resource. If you haven’t heard of Raspberry Pi before then take a look at their site. Raspberry Pi is an affordable, credit-card-sized computer developed to teach and promote computer science in schools. It can be plugged into a TV and keyboard and it’s aim it to make computer programming accessible to children. Edmodo is a social learning platform for teachers, students, and parents. Teachers and students can assign and submit coursework, discuss class assignments, collaborate in groups, talk to teachers and share ideas and resources. It’s basically a Facebook for schools and would almost certainly make communicating with students (and teachers) easier and more efficient. This free tool is for designing and creating online games. It enables students to make computer games using visual programming tools, without needing to understand code. Students can create different worlds and characters and learn about narrative, story-telling, problem solving. It can be used on a PC and Xbox. 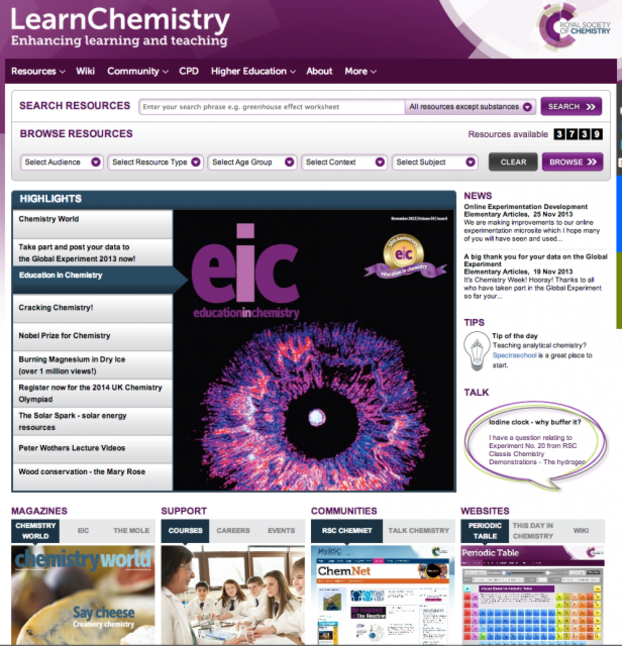 Learn Chemistry is a rich online resource for teachers and students of chemistry. It’s a valuable free resource for all ages – from Primary to HE. It includes a searchable database of worksheets, handouts, chemistry demonstrations and interactive assessments. It has a collaborative Wiki page, forum and CPD pages to help connect, share and expand your chemistry knowledge. This is THE place to go for anyone learning or teaching chemistry. Inspiring stuff! The Makewaves app launched last year and it provides a way for students to create stories, videos and blog posts on the go within the safe and accessible Makewaves environment. Teacher’s can also add additional tools to the app so they can approve work and mark students while outside the classroom. True Tube is an invaluable free resource for RE, PSHE and Citizenship at Key Stages 3 and 4. It offers access to videos, assembly scripts and lesson plans for these subjects. It’s a well designed website with access to the key topics and themes within this subject area. TrueTube was the well deserved winner of the 2013 BETT Award. It’s going to be a tough call for the judges this year as there’s a number of excellent free tools out there! My bets are on Cambridge University Press, OCR and Raspberry Pi for Cambridge GCSE Computing but lets see for ourselves in January! Last week Usborne Publishing published a blog post about my role at Teach Your Monster to Read. I thought i’d share the post with our fans too. Teach Your Monster to Read has been created by a small, expert and dedicated team. My role within the team is Community Manager. As Community Manager I talk to the parents and teachers of our young players and keep up to date with our audience. I help them with their queries and feedback and gain insight into how we can improve the game and the user experience for everyone. Above: Me at my desk! I run fun competitions, such as the latest ‘Dress Your Teacher or Parent as a Monster’ – where we’ve had some fantastic (but scary) entries sent in. 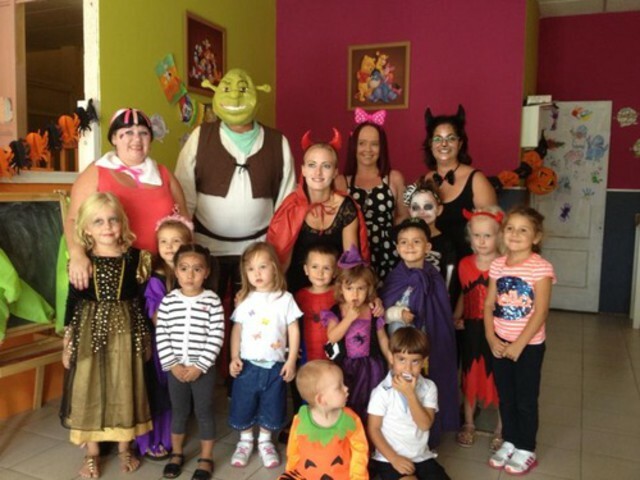 Above: Crawfordsburn Primary School dress up their teachers for Halloween. I search, read and share relevant articles and news stories that our audience may find interesting. These articles could be about teaching, education, parenting, gaming or even just some monster facts (we love monsters at Teach Your Monster to Read)! 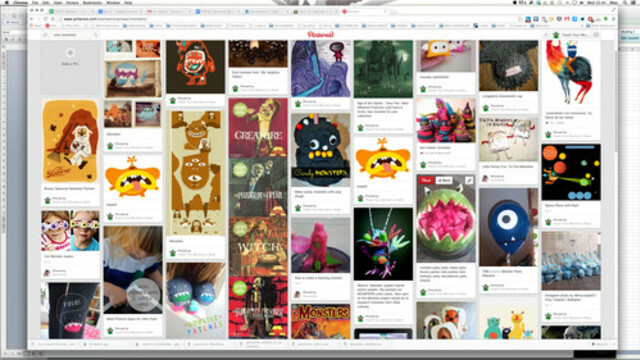 I also curate our Monster Pinterest page which features many monster related games and activities for children. 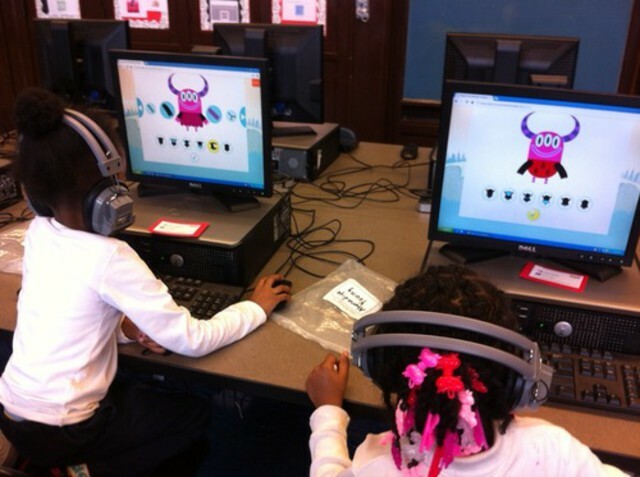 As Teach Your Monster to Read is a web based game, a lot of my work is done online, through blog posts, Facebook, Twitter, online forums, email and the Teach Your Monster to Read website. However, I also go out and about to educational conferences and Teachmeets throughout the year. When the games go out to schools for testing, I also get meet our young players in person and hear their thoughts about the game, I even get to see some of their monster impressions! 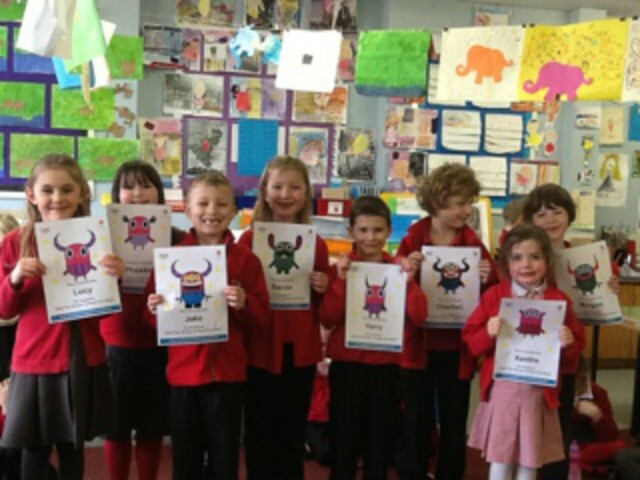 Above: Our players and their monsters at Royden Primary School. 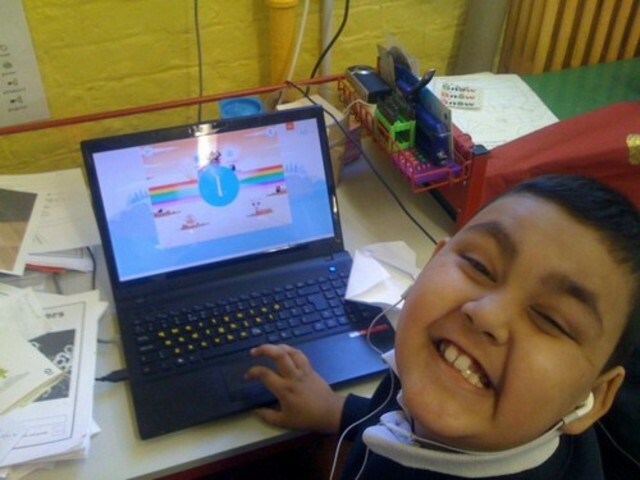 Above: Binyaameen at Snowsfields Primary School, testing the game. The audience for the game is truly international – we have players in countries such as Spain, Hawaii, New Zealand and China. We learn a lot about the game from our players and I’m proud to say that the feedback we receive is very positive. Our players LOVE the game! 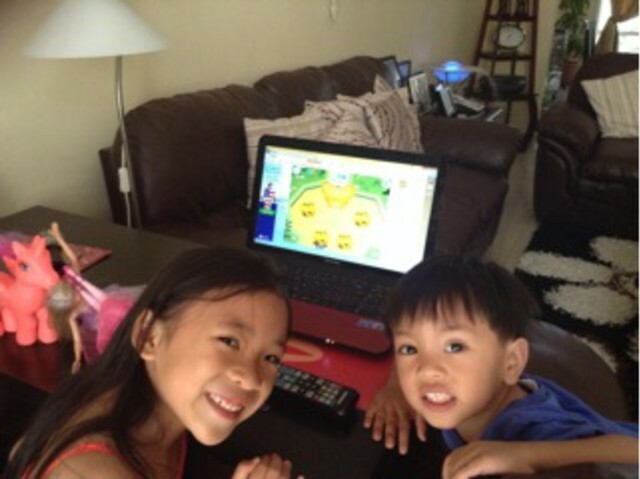 Above: Arabella and Naeem enjoying Teach Your Monster to Read. Above: Two of our US fans designing their monsters. For more information about Teach Your Monster to Read, you can contact me here [email protected] or find us online. We had some fantastic entries to our Dress Your Teacher or Parent as a Monster competition last month – including headless heads, creepy zombies, monster mummies and devillish dads! Our judges, Ceri Williams and his student, Jack came to a nail-biting decision last week. They decided to award the winning prize to Bryan Clark and his 3 sons for their amazing recreation of H.P Lovecraft’s monster Cthulhu. Congratulations Bryan and the boys! You will receive £150 worth of Usborne books of your choice. 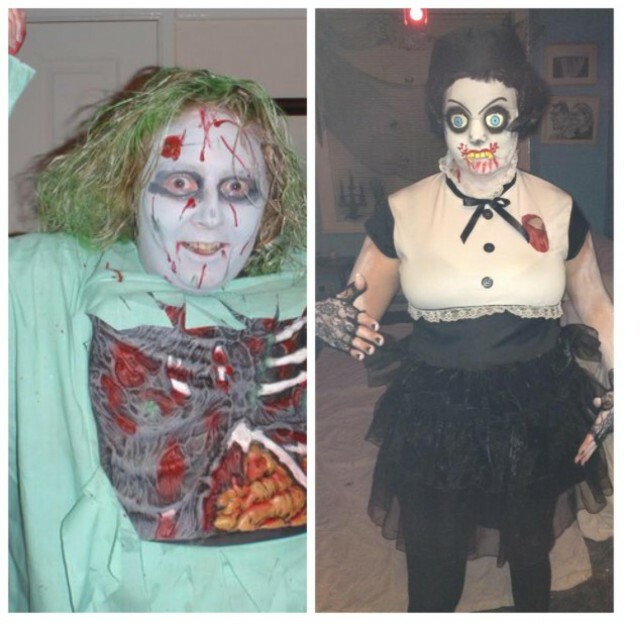 Our runners-up have been decided too and £75 worth of Usborne books will each go to Lisa Waugh for her terrifying Zombie and to ‘monster mummy” Emily Morris. Thanks to everybody who entered the competition. We had a brilliant time looking at all the marvellous costumes. 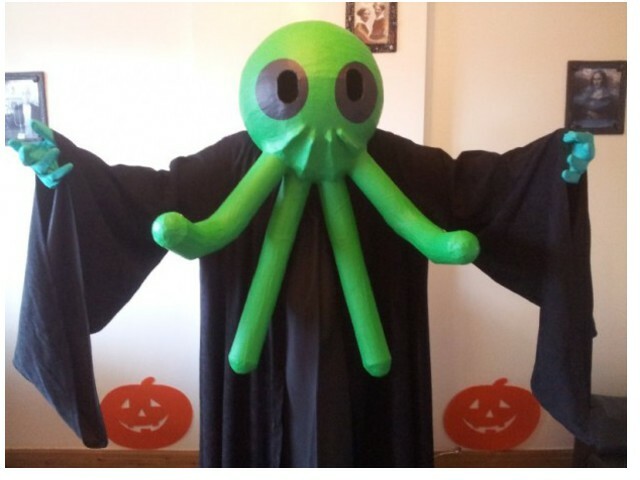 To look at all of the monster entries, go to our Facebook gallery. They’ll be another competition early next year so watch this space!